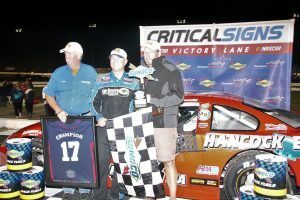 Winning the final race of the season is always the sweetest and Eddie MacDonald did just that with a dominant performance in the American Canadian Tour’s 75 lap feature at Thompson Motor Sports Park Sunoco World Series of Racing Saturday night. The victory was especially sweet after a disappointing 11th place finish in the Pro Stock feature on Friday night. Saturday’s ACT Late Model practice was reduced to one half hour due to morning rain but the EXIT Realty/Hancock Electric Chevy ran in the top three and posted a +3 rating in the heat. Eddie Mac started fifth then raced to a second place finish to receive the fifth starting position for the season finale on the fast, high-banked 5/8th of a mile oval. When the green flag waved, Eddie Mac wasted little time charging to the front and into the second spot by lap seven. The first caution flag flew on lap 11 (the first of six including a red flag) reset the field with Eddie Mac on the outside pole. The veteran racer then powered past the #4 to the lead on the restart only to give it back to the #4 after a lap 14 caution. However, the Freddie Peterson owned Chevy challenged for the lead then powered to the top spot on lap 19. A series of cautions plagued the first 28 laps yet Eddie Mac’s dominant restarts were no match for any competitors. As noted, the 60 lap Pro Stock feature on Friday night began with Eddie Mac on the pole when the field was inverted from first to ninth position. The Dave Lemieux owned Chevy struggled with a tight condition in practice and continued in the first heat race. Starting sixth, Eddie Mac was able to drive to the fourth position but slipped back to fifth as a result of the tight condition. Adjustments were made to loosen up the car for the feature. With the inverted line-up posted, Eddie Mac took the green flag to lead the field for the first 15 laps before Griffiths took the lead. Despite regaining the top spot briefly on a lap 15 restart, Eddie Mac dropped to third behind Griffiths and Randstrom. A lap 31 restart after a caution ended any chance of winning when the right rear began going down finally sending the Rowley, Mass. driver to the pits on lap 40. Returning to the track three laps down, the EXIT Realty/Annie Mac Home Mortgages Chevy completed the final 20 laps to post the 11th place run.